The FT quotes Clapper as saying he gave the answer “he considered to be ‘the least truthful. '” The Irish call this being economical with the truth. Lawyers call it equivocation. As the Obama administration “pivots” towards Nixon (illegal bombings of countries we are not at war with, going to China, domestic spying on U.S. citizens, using the IRS to muck with your enemies, and health care reform – remember it was Ted Kenndey who helped defeat Nixon’s proposals for comprehensive and universal health care), and with the administration’s intent to ramp up the war in Syria, you have to wonder if the Nobel Foundation is thinking of asking for their Peace Prize back. Although Henry Kissinger was also a recipient of the Peace Prize, so perhaps the Swedish definition of “peace” loses something in translation to English. Just as Richard Nixon had his Daniel Ellsberg, Barack Obama has his Edward Snowden. Ellsberg worked for the RAND Corporation and leaked the famous Pentagon Papers. Snowden worked for Booz Allen Hamilton and now resides in Hong Kong. His fame is as yet undecided, but he leaked what may one day be called the Prism Papers. To stretch the 70’s analogy further, we even have hunger strikers. Although it was actually in 1980 that IRA members began their hunger strikes at the notorious Maze Prison in Northern Ireland. Detainees at the notorious Guantanamo have been on hunger strikes since 2005 (different detainees at different times, obviously). But now the world hardly takes notice. Allow me one more digression here, because words matter. The British called the IRA paramilitary prisoners “internees,” as if they were gaining valuable on the job experience. Which in a way they were. The U.S. calls the prisoners at Guantanamo “detainees,” as if one is temporarily inconvenienced. Like when the Captain of the airplane comes on speaker and says your flight will be slightly delayed while they offload some luggage, for something like ten years. The word “security” is a broad, vague generality whose contours should not be invoked to abrogate the fundamental law embodied in the First Amendment. The guarding of military and diplomatic secrets at the expense of informed representative government provides no real security for our Republic…The greater the importance of safeguarding the community from incitements to the overthrow of our institutions by force and violence, the more imperative is the need to preserve inviolate the constitutional rights of free speech, free press and free assembly in order to maintain the opportunity for free political discussion…Therein lies the security of the Republic, the very foundation of constitutional government. Upper class twits or nitwits? One of the exhibits we viewed at the Asia Society Museum while in New York was Vandy Rattana’s Bomb Ponds. Between 1965 and 1973, the United States conducted illegal bombings of Cambodia and Laos, countries with which we were not at war. The bombings, eventually code named “Operation Menu,” began under President Johnson and escalated under President Nixon and Secretary of State Kissinger. The full extent of the bombings was not known until the year 2000, when the official documents were declassified. The modern equivalent of the U.S. bombings of Indochina can be found in President Obama’s use of drones, which are used to bomb countries with which we are not at war. Despite how drones are sanitized for the U.S. public as some sort of video game, if the act of bombing foreign countries we are not at war with was illegal in 1970, it must still be illegal today. After all, it makes no difference whether the bomb that kills you is dropped from a B-52 or a drone. Or do, in fact, the ends justify the means? That is dangerous logic. What will the “bomb ponds” in the Middle East look like in 2050, and how will the United States, President Obama and Secretary of State Clinton be remembered in this region forty years from now? A poignant series of photographs and a one-channel video by Vandy Rattana exploring the U.S. bombing of Cambodia during the Vietnam War. 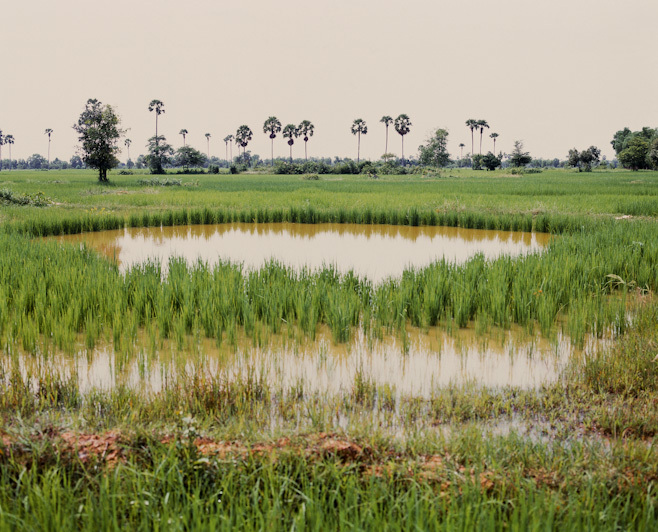 The serenity of Vandy’s images belies the violent history of the landscape, while his video highlights the resilience of the Cambodian people. Bomb Ponds also brings attention to the lack of documentation of these unwarranted acts of violence undertaken by U.S. government. 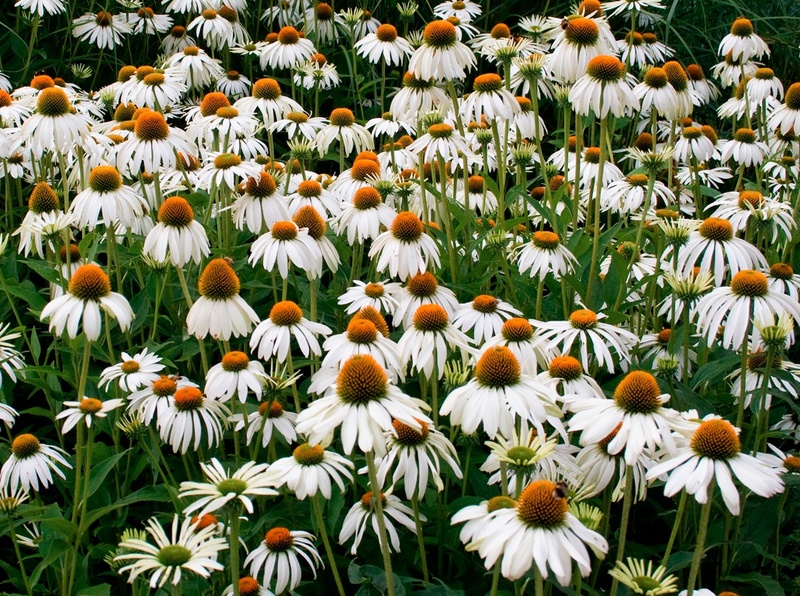 …let us sit upon the ground and tell sad stories of the death of children. …Min Yongjun burst into a classroom and hacked away at 23 children, severing ears and fingers. But in Newtown, Connecticut, the little ones suffered even worse. After a ten-minute rampage 20 of them were dead, as were six teachers and the killer himself. The American was armed with a semi-automatic rifle with an extended magazine and two semi-automatic handguns. Every country has its madmen, but Min was armed only with a knife, so none of his victims died. – The Economist, Newtown’s Horror, December 22, 2012. Another argument put forth by the National Rifle Association is that if you outlaw guns, only criminals will have guns. But criminals, after all, have lots of things they are not supposed to have. By this logic, whatever a criminal possesses, so may you. Is this not how a child thinks when it sees a toy in the hands of another? The balance of power is the scale of peace. The same balance would be preserved were all the world destitute of arms, for all would be alike; but since some will not others dare not lay them aside. And while a single nation refuses to lay them down, it is proper that all should keep them up. Horrid mischief would ensue were one half the world deprived of the use of them; for while avarice and ambition have a place in the heart of man, the weak will become a prey to the strong. The history of every age and nation establishes these truths, and facts need but little arguments when they prove themselves. But “horrid mischief” results from the unrestrained proliferation of weapons which often fall into the wrong hands. And the “balance of power” argument falls apart in the context of an arms race when weapons become increasingly destructive – think of the Cold War phrase “Mutually Assured Destruction.” Shakespeare had a phrase for that as well “… that way madness lies; let me shun that; No more of that.” – King Lear. The [second] amendment originated in Anti-Federalist concerns that Congress might misuse its power of “organizing, arming, and disciplining the Militia” to neglect it entirely. The militia might be disarmed, George Mason warned the Virginia ratification convention, not by federal confiscation of private firearms, but simply by Congress’s failure to keep militiamen adequately equipped…That neglect, in turn, would make it easier for the “standing army” Congress would control to trample the reserved rights of citizens and states. 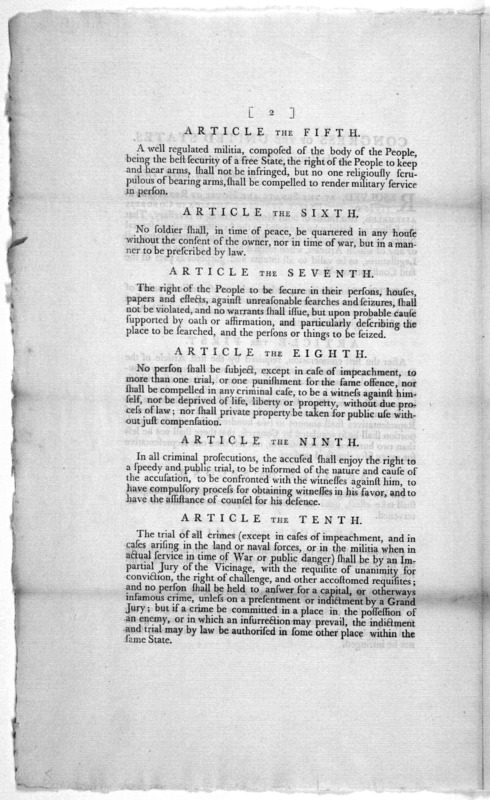 The liberties of a people are in danger from a large standing army, not only because the rulers may employ them for the purposes of supporting themselves in any usurpations of power, which they may see proper to exercise; but there is great hazard, that an army will subvert the forms of the government, under whose authority, they are raised, and establish one [rule], according to the pleasure of their leader. If a well-regulated militia be the most natural defense of a free country, it ought certainly to be under the regulation and at the disposal of that body which is constituted the guardian of the national security. If standing armies are dangerous to liberty, an efficacious power over the militia, in the body to whose care the protection of the State is committed, ought, as far as possible, to take away the inducement and the pretext to such unfriendly institutions. Note that the Federalist position emphasized the regulated aspect of the militia. As a transitive verb, regulate means to “control with reference to some standard or purpose” (Oxford English Dictionary) – as in regulation. This important word found its way into the Second Amendment as a qualifier seen in the phrase “a well-regulated militia.” Thus, gun control is constitutional and to argue the point otherwise is to advocate an unconstitutional position. The distinction between a “militia” and a “standing army” is also critical. A “standing” or “professional” army is what most nations have today – such as the United States Armed Forces, consisting of the Army, Navy, Marine Corps, Air Force, and Coast Guard. This is precisely what the Founding Fathers feared. To counter the threat that a “standing army” would be used by a government to oppress its people, the right to bear arms was considered necessary so that the people could form “militias” to counter this threat. I’ll leave you to figure out whether such a “militia” would pose more than a moderate nuisance to a modern army. Although come to think of it, the militias in Iraq and Afghanistan have had some success in fighting the United States and the Soviet Union. If you honestly believe that you need guns to protect yourself from the government, which strikes me as slightly treasonous, then you really must have a surface to air missile. Because if the government decides to come after you, they will send in the drones in first. Good luck to you in that case. The French Revolution…invented the modern conception of the nation under arms…Whereas the rebellious Americans thought in terms of raising local militias, the French revolutionaries inherited the monarchy’s standing army and made it the cutting edge of revolutionary change throughout mainland Europe. The Second Amendment is an anachronism. It belongs to a different time, and as originally intended is no longer relevant in the 21st century. It was written when a gun was a rifled musket, and both militia men and government troops were armed with the same weapons. The match was relatively even. Now, governments have fighter jets, nuclear submarines and weapons, cruise missiles, drones and satellites. The match can never again be close to even, and the law must change to reflect the fact that the Second Amendment’s “well regulated militia” is no longer an effective deterrent to a modern “standing army.” Even Thomas Paine felt that “…every generation has an indefeasible natural right to decide for itself what form of government to live under…” (Alan Ryan, On Politics). It continues to be a great tragedy that the lack of any form of gun control “…is justified by the age-old (ie, barbarous) eighteenth-century right granted to every American to bear arms with which to defend himself against Red Indians and King George..” (The Economist, American president Ronald Reagan is shot, April 4, 1981). Although in the interest of full disclosure, you should know that The Economist is an English publication…and they still seem a little touchy about our treatment of poor King George. In a surprise announcement, the NBA has revealed that the Sacramento Kings will be moving to Pyongyang, North Korea. Earlier in the year, Dennis Rodman visited the Supreme Leader Kim Jong-un in the hermit kingdom. Those in the west were initially puzzled by Rodman’s trip, the purpose of which has now been acknowledged to conduct secret negotiations regarding the sale of the Kings. Secretary of State John Kerry likened Rodman’s North Korean mission to Henry Kissinger’s clandestine talks with Beijing in the 1970s which paved the way for President Richard Nixon to visit China and meet with Chairman Mao. Questions immediately arose about North Korea’s menacing nuclear threats. 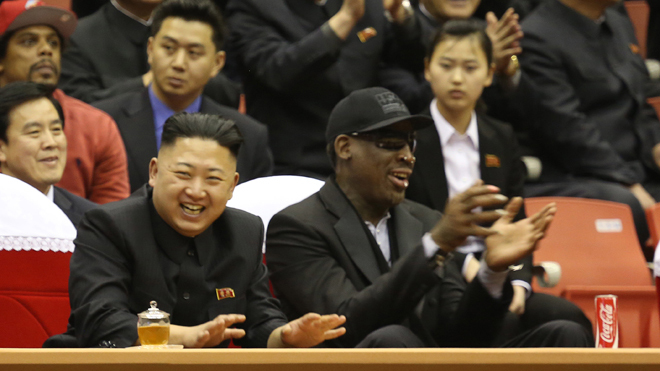 Dennis Rodman noted that Kim Jong-un likes to have “a bit of fun,” and is really “a great guy to hang out with.” Others suggest that the perceived threats by the west are merely the result of cultural misunderstandings. “We know how you Americans like your wars,” stated an anonymous source from the Korean Social Democratic Party. As to the purchase price, sources within the City of Sacramento remain tight lipped. It is well known that North Korea is short of hard currency. But a spokesperson for the North Korean Government stated that Pyongyang has reached an understanding with Sacramento that will allow the Capitol of California to keep the proceeds from parking concessions in Pyongyang over the next ten years. Analysts have estimated that this deal is worth upwards of thousands of dollars a year. Korean watchers in the west now realize why references to Communism were removed from North Korea’s constitution in 2009. “It simply wouldn’t do to have “Kings” as part of the name of the basketball team of a communist nation,” according to the U.S. State Department. Dennis Rodman is expected to return to the hermit kingdom later this year. The word “hero” is often overused. But with yet another school shooting, this time at Taft Union High School, a teacher once more stood in the line of fire and saved the lives of children. At Sandy Hook Elementary School, some teachers spilled blood and gave their lives so that their precious charges could live. F. Scott Fitzgerald wrote “Show me a hero and I will write you a tragedy.” It is a dishonorable tragedy that our nation continues to undervalue its teachers. During a strike by Chicago teachers, Mitt Romney accused teachers in that city of turning their backs on “hundreds of thousands of children relying on the city’s public schools to provide them a safe place to receive a strong education.” Teachers in Wisconsin were disgracefully demonized and accused of being greedy by a media and public not knowing the meaning of that word “hero,” while trillions of dollars continued to pour into banks. Governor Brown, in a thinly disguised act of extortion, threatened to further gut funding for California schools unless the public paid more money into state coffers in the form of higher taxes. And, it continues to be a great shame in California that we pay more money to incarcerate than to teach. The sweep of history is long, and events that happened one-hundred or even thousands of years ago continue to have repercussions in the present. Particularly in the Middle East. The outcome in 1916 of these secret negotiations was what has become known as the Sykes-Picot Agreement, which divided the Ottoman Empire into areas of British and French control. How were these areas of control determined? In a conversation with Arthur Balfour, Sir Mark Sykes, the British negotiator, traced his finger across a map and said “I should like to draw a line from the ‘e’ in Acre to the last ‘k’ in Kirkuk.” The map attached to the Agreement shows this literal “line in the sand” with the British sphere of control colored in red and the French sphere colored blue. The original red and blue states, if you will. But this carve up failed to take account of the various promises made to the Arabs. 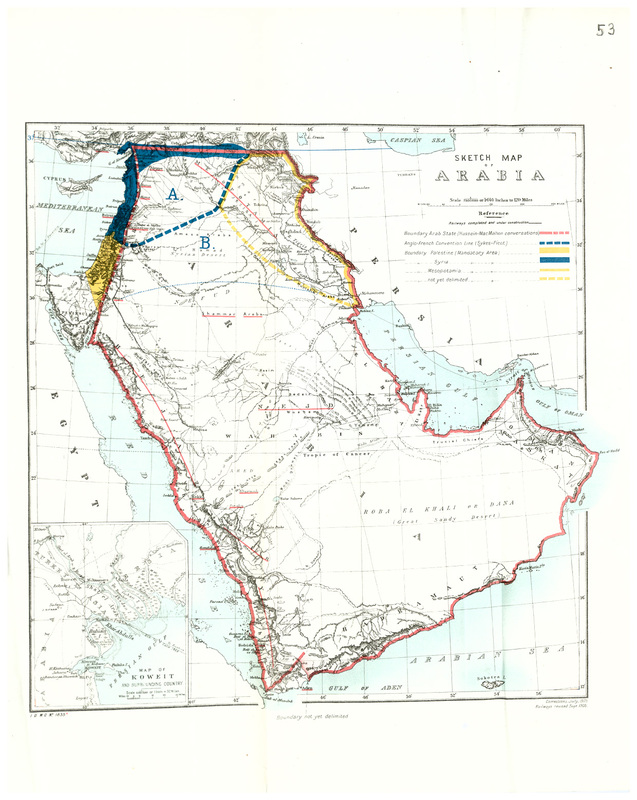 1921 U.K. government map of the Middle East. The failure of the Gallipoli landings caused the British to worry that the Turks might mount an attack on the Suez Canal which would have cut Britain off from its empire in India. The idea was hatched in 1915 to provoke an Arab uprising. Sir Henry McMahon, the British governor of Egypt, made entreaties to Sharif Husein of Mecca. If the Arabs would turn against the Turks, British aid would follow, and Britain would support the Sharif’s claim to a Middle Eastern empire. But in putting this support in writing, the British engaged in an act of deceit that is still remembered in the Arab world today. The key phrase in McMahon’s letter to Husein was “…we accept these limits of boundaries; and in regard to those provisions of the territories therein in which Great Britain is free to act without detriment to the interests of her ally France…” To compound the deceit, the second qualifying phrase was dropped from the Arabic translation. The Treaty of Versailles in 1919 officially ended World War I and also established the short-lived League of Nations. 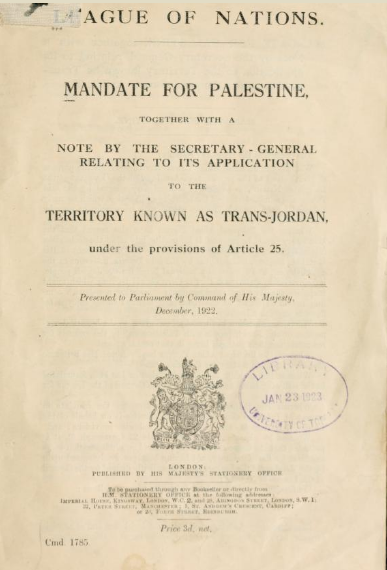 The League created a British Mandate for Palestine which began on September 11, 1922. Another date which has not been forgotten in the Arab world nor more recently in the Western world. 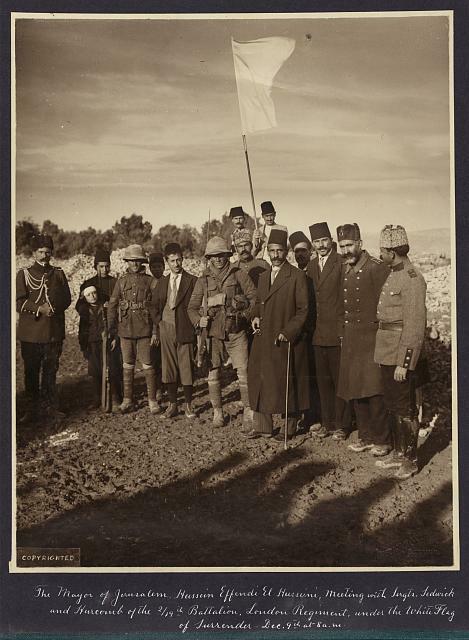 The surrender of Jerusalem by its mayor to British troops on December 9, 1917. Map of the Middle East, circa 1020 BCE. And what of events thousands of years ago in the Middle East? 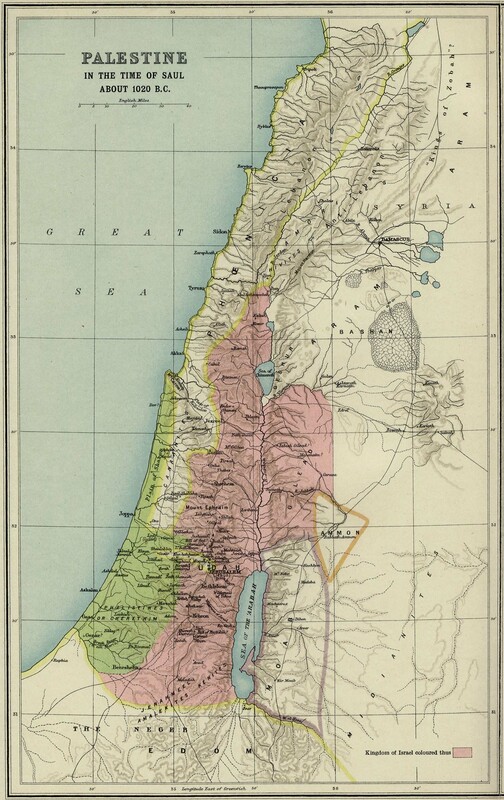 Sometime around 1100 BCE, God directed the Hebrew tribes coming out of Egypt to commit what today the United Nations would call Genocide against the indigenous Canaanites who had been living in the region since probably 2750 BCE. The primary sources for this blog are two books I can highly recommend: A Line in the Sand, by James Barr, and Sowing the Wind, the Mismanagement of the Middle East 1900-1960, by John Keay. Conceding that voters will likely give the bird to his proposed tax increase on June’s ballot, Governor Jerry Brown is expected to announce on April1st a new program designed to plug California’s chronic budget deficit. Called SURF (State Utilization Resource Fund), the program will generate revenue from the sale of certain state assets and will provide development opportunities in under utilized areas of this vast state. Starting in June, construction will begin to expand Highway 1 into an eight-lane super highway that should allow travel between San Francisco and Los Angeles in just under three hours. “Special dispensation from federal authorities will be requested which will allow the speed limit in non-urban areas to reach 110 mph,” according to sources in the Governor’s office. This program will bring jobs and expand the economies of sleepy, practically abandoned coastal towns like Ragged Point, Lucia and Gorda, as well as provide a real challenge to those who like to text while they drive. Remaining funds will be raised by selling soon to be closed state parks along the coast to developers and by privatizing the state’s parking concessions. “This is prime real estate and should sell at a premium. It’s what accountants call a ‘sunk cost.’ We own it, it’s not being used, so let’s sell it and generate some positive cash flow,” according to the Governor. Montana Del Oro at sunset. In other words, the banks will be able to use an existing initiative, the $30bn Home Affordable Modification Program (HAMP) under which taxpayer funds are provided to banks as an incentive to modify loan agreements, towards the $40bn settlement. This settlement is an atrocity, and those who are a party to it should be charged with defrauding US taxpayers. Interestingly enough, our government can use pepper spray against its own citizens, but cannot use it in warfare. See the Chemical Weapons Convention here. Is freedom of speech an illusion in our country? Take a glance at this YouTube video of police pepper spraying students at UC Davis the other day. The video is long enough that you can see the crowd was peacefully assembled. Just who are the police protecting and serving these days? Perhaps the bankers, politicians and wall street barons? The babble that passes for news on most television stations equates dissent with unpatriotic behavior. Which is dangerous. Dissent is essential for a healthy democracy. An entire generation has come of age in this country without experiencing a proper, thoughtful, debate. This season’s Republican debates are so absurd that they would not be out of place airing on Comedy Central. In February of 2009, I suggested it was time for another revolution in this country (Revolutionary Road). 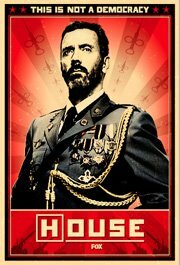 Perhaps this is what the Occupy movement will become, but it has yet to find a voice. I am not against capitalism. My wife and I watched a show the other evening on the construction of the Airbus A380 which we had the pleasure of flying last summer. Such a plane would not be possible without capitalism and the financing it provides. You cannot imagine Aeroflot, the flag carrying Russian airline, coming up with something like that. But our government certainly isn’t here to help. Congress can’t even balance a checkbook much less decide whether pizza is a vegetable!